A Treat for the Muscles! Scientists using CRISPER-Cas9 gene-editing technique have managed to better the lives of four dogs suffering from the most common form of muscular dystrophy, Duchenne. A research team led by U.T Southwestern Medical Center edited muscle cells in young dogs with Duchenne to remove a short, problematic segment of protein-coding DNA that occurs in both canine and human patients. Within about two months, the dogs were producing a greater amount of dystrophin. To get this gene-editing technology into the dog’s muscles, the research team created viruses to transport the gene-editing machinery. To do so, the scientists had to extract some of the virus’s own DNA in order to fit the gene-editing machines. The viruses were assigned either of two tasks. Some viruses carried Cas9-molecular “scissors” to cut out the DNA sequence that blocks the production of dystrophin in muscle cells. The other viruses carried a guide molecule to help the Cas9 to identify where it should make those cuts. Using viruses as a means to transport the gene-editing technology is very helpful because viruses are very small, even smaller than bacteria. When a virus enters your body, it invades some of the cells and takes control of the cell’s functions by injecting its genetic materials into the cell. For now, the research team has already demonstrated that CRISPR can treat Duchenne in human cells in the lab, but this test was the first success with a large mammal. Adding on, for this study, the research team focused on the protein level, not on how this treatment may have affected the dog’s behavior. To conclude, one question that remains in the air after this demonstration is how long one injection with CRISPR will last in human Duchenne patients versus dogs. The research team is hoping once, but there is still so much to discover! CRISPR/CAS9: Potential to destroy malaria? CRISPR. Sounds more like a new brand of potato chip than something potentially revolutionary (Bold new flavor. Bold new crunch. CRISPR.). Nevertheless, this tool used for easy gene editing and slicing is tearing up the science world because it could be the key to combatting disorders and diseases. Recent research indicates that CRISPR/Cas9 based genome editing tools could aid in the fight against malaria, one of the “big three” diseases that has long affected and continues to affect humans worldwide. How is CRISPR/Cas9 able to do this? CRISPRs (Clustered Regularly Interspaced Short Palindromic Repeats) originally are how bacteria protect themselves from foreign viruses. CRISPRs contain DNA from viruses that have attacked the bacteria, and so when a similar virus attacks, the bacteria knows that this virus and his DNA are bad. Essentially, CRISPRs allow bacteria to build up immunity. 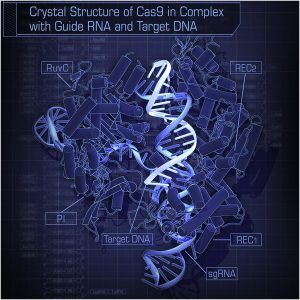 When foreign DNA is detected, the Cas9 enzyme is guided by the CRISPR and is able to cut the desired DNA. Scientists have come up with a way to engineer and manipulate the CRISP/CAS9 system into other organisms (such as mosquitoes) so that we can successfully edit genome sequences and genes to produce desired results. We take advantage by specifying which genes the Cas9 should cut/replace, and then it does just that. Therefore, the CRISPR/Cas9 system allows us new genome editing potential like none before. How does this apply to mosquitoes and malaria? Scientists experimented with genetically modified malaria-transmitting mosquitoes (Anopheles gambiae), altering the fibrinogen-related protein 1 (FREP1) gene on them. This gene essentially codes for a protein that makes mosquitoes a vector for malaria. The scientists used the CRISPR/Cas9 to inactivate this gene. The results produced mosquitoes with significantly less transmission of malaria to both human and rodent cells. However, these mosquitoes have “reduced fitness”: a significantly lower blood-feeding propensity, egg hatching rate, a retarded larval development, and reduced longevity after a blood meal. Essentially this means that these mosquitoes have a low chance of affecting populations of mosquitoes in the wild without being “pushed” by scientists, where scientists are “forcing DNA to inherit particular sets of genes.” This is called a gene drive. With a strong push for a couple of years, there is potential for worldwide mosquito populations to be significantly changed in 10-15 years. I chose to write about this new research and potential breakthrough because it really means something to me, as I have lived in and visited countries threatened by malaria. I had to take preventative pills every morning, and I would have to sleep in a restrictive mosquito net. All that made me wonder about and feel for a kid in the same country who didn’t have those things and how he or she would manage without those barriers to malaria. Having said that, I really do believe this is a worthwhile option we should explore, and I think it can make a difference for the world. What do you think? Do you think it is realistic for theses mosquitoes to change the entire mosquito population and effectively help reduce malaria transmission? Will CRISPR/Cas9 work as we hoped? Or is it too good to be true? CRISPR is a revolutionary system that edits the DNA of living organisms with ease. The gene-editing technology offers scientists insight into genetic diseases and is widely used in biotech and agriculture, as well as to treat cancer and viral infections. But the CRISPR system and its mechanisms are not yet fully understood. However, researchers at the Ohio State University have reported that they have figured out the mechanism of how the CRISPR system figures out where and when to cut the DNA strands. This is particularly revolutionary as it provides insight into preventing gene-cutting errors. Cas9 is an enzyme that is used by the system to target and cut out or insert specific genes. In the second of two paper published in the Journal of the American Chemical Society, the team invalidates the widely-held belief that the enzyme cuts DNA evenly. Professor of chemistry and biochemistry Zucai Suo explains that instead of cutting both sides of the DNA double-helix to the same length, Cas9 actually trims each side to uneven lengths. Ohio State doctoral student Austin Raper and his co-authors determined that the two different parts of the “Cas9 molecule communicate with each other to set the location and timing of a cut”. The first part of the molecule sets forth to cut its respective DNA strand and changes shape and signals to the second part to cut its respective second strand. Suo says that he hopes their work allows for scientists to minimize and eventually eliminate gene-editing errors. CRISPR rarely target unintended genes, but gene-editing errors can have very serious consequences. 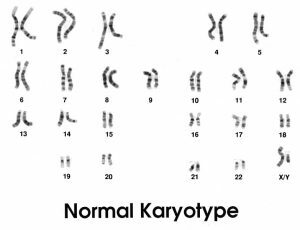 For example, if the system accidentally cut a tumor suppressor gene from a person’s DNA, they would be much more likely to develop cancer. As Raper says, it is important to understand CRISPR and the Cas9 enzyme mechanisms in order to allow CRISPR to advance to its full potential. A new discovery has highlighted the positive effects that the revolutionary new gene editing tool, CRISPR-Cas9, can have. Scientists at the Johns Hopkins Bloomberg School of Public Health’s Malaria Research Institute have discovered that the deletion of a single gene from the Anopheles Gambiae mosquito, called the FREP1 gene, yields promising results in the eradication of the malaria disease. The FREP1 gene has been associated with being a malaria “host factor” gene because it helps the parasite live in the gut of the mosquitoes. However, the scientists, using the CRISPR-Cas9 gene editing procedures, have been able to delete the FREP1 gene from the mosquitoes and have seen significant decreases in the spread of malaria. Without the host factor gene, the parasite has difficulty surviving in the mosquito, which decreases the spread of the disease to other organisms. The deletion of the FREP1 gene had other effects in addition to the resistance of the malaria parasites. In the mosquitoes where the gene was deleted, many showed no signs of sporozoite-stage parasites in their salivary glands, which can spread to humans through mosquito bites. George Dimopoulos, PhD, professor in the Bloomberg School’s Department of Molecular Microbiology and Immunology, commented on the study, saying that “if you could successfully replace ordinary, wild-type mosquitoes with these modified mosquitoes, it’s likely that there would be a significant impact on malaria transmission”. CRISPR is starting to become more and more of a reality as Harvard professor David Liu continues to work on it. Liu was the person who originally developed CRISPR first base editor which allowed for single letter changes in the genetic code. Liu has come up with two new features to CRISPR-Cas9. The first is called cellular detective or CAMERA(CRISPR-mediated analog multievent recording apparatus systems). What this function does is it finds the genetic problem that is responsible for the disease someone is experiencing. Cas9 will record all the cell data and piece info together, which overall will provide more information about cancer, stem cells, aging, and overall disease. The second finding is referred to as sharp scissors which is a CRISPR enzyme. Sharp scissors are way more precise and accurate than the old enzyme making is much safer. The scissors depend on specific DNA to find the region where it is supposed to cut or edit. CRISPR is progressing and as more research is being done could be used on humans in the future. A new enzyme named xCas9 allows researchers to target more sites in the genome than with traditional CRISPR-Cas9 editing, while also reducing off-target effects. The technique was reported earlier this year (February 28) by a biologist David Liu and his colleagues. 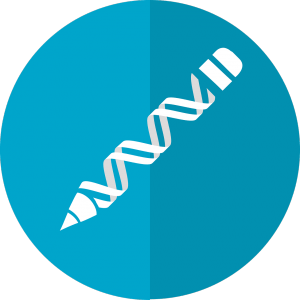 CRISPR-Cas9 has become the gene-editing tool of choice in many labs due to the effectiveness and convenience. But CRISPR-Cas9 has limitations like the necessity of targeting a particular sequence called a PAM near the gene to be modified, which limits researchers’ ability to make specific genetic changes. Liu and his colleagues used a laboratory technique to evolve an enzyme that could recognize a broader range of PAM sequences, enabling more sites in the genome to be targeted. It just so happens that xCas9 also turned out to be more specific to the targeted sites, with fewer off-target effects. xCas9 will allow gene therapy to have higher success rates. Some scientists say, “you can do anything with CRISPR” and others are absolutely astonished and amazed. CRISPR can rapidly change any gene in any animal or plant with ease. It can fix genetic diseases, fight viruses, sterilize mosquitos and prepare organs for transplant. The possibilities are endless – and the prospect of designer babies isn’t far off. Dead Cas9 can fix a single base pair typo in DNA’s genetic instructions. It can convert a C-G into a T-A pair. Also, we can attach fluorescent tags to dead Cas9 so researchers can locate and observe DNA or RNA in a living cell. Dead Cas9 can also block RNA Polymerase from turning on a gene, in CRISPRi. In CRISPRa, a protein that turns on genes is fused to dead Cas9. CRISPR can be used for anything involving cutting DNA. It guides molecular scissors (Cas9 enzyme) to a target section of DNA & works to disable or repair a gene, or insert something new. Many scientists have been thinking of improvements for this miracle gene editor. RNA Biologist Gene Yeo compares the original Cas9 to a Swiss army knife with only one application – a knife. He says that by bolting other proteins and chemicals to the blade, they transformed the knife into a multifunctional tools. CRISPR/Cas9 is special because of its precision. It is much easier to manipulate and use compared to other enzymes that cut DNA. By using “guide RNA” it can home in on any place selected by the researcher by chemically pairing with DNA bases. While Cas9 does have some problems, scientists definitely see the potential for greatness with a few tweaks. They wanted to ensure permanent single base pair changes, and they increased that from 15 to 75 percent. Liu used a hitchhiking enzyme called cytidine deaminase. 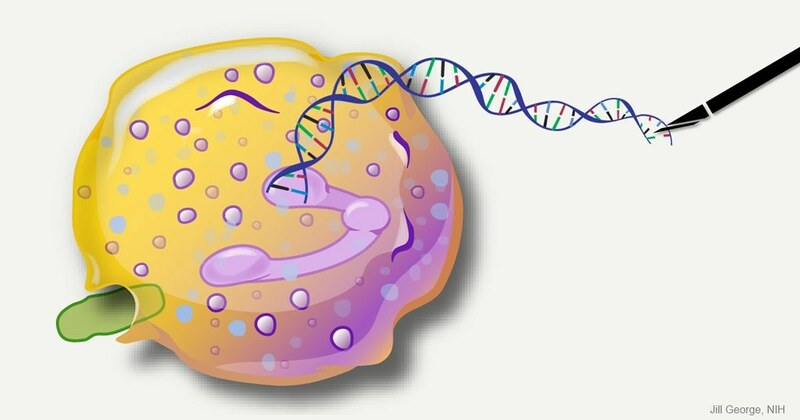 Scientists researched chemical tags on DNA called epigenetic marks. When scientists placed the epigenetic marks on some genes, activity shot up. This provided evidence that the mark boosts gene activity. Case can also revolutionize RNA biology. The homing ability of CRISPR/Cas9 is what makes this seem possible. It was found that Cas9 could latch on to mRNA. 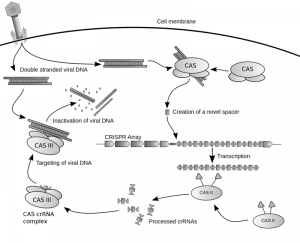 CRISPR/Cas9 was first found in bacteria as a basic immune system for fighting viruses. It zeroes in on and shreds the viral DNA. Half of bacteria have CRISPR immune systems, using enzymes beyond Cas9. Overall scientists predict that in the next few years, results will be amazing. The many ways of using CRISPR will continue to multiply and we will see where science takes us. Anti-CRISPR Proteins: What are they and can they be beneficial? For many bacteria, one line of defense against viral infection is the RNA guided “immune system” known as CRISPR-Cas. This particular complex is unique because of its ability to recognize viral DNA and trigger its destruction. Scientists have used CRISPR to degrade sections of viral RNA and use the CRISPR systems to remove unwanted genes from an organism. CRISPR proteins have also been studied with the hope of eliminating serious disease and illnesses. However, this CRISPR system does not always work do to anti-CRSPR proteins that inhibit the complex from working properly. According to an article on ScienceDaily, researchers have finally discovered how these anti-CRISPR proteins work! Research done by biologist Gabriel C. Lander from the Scripps Research Institute, discovered that anti-CRISPR proteins work by inhibiting CRISPR’s ability to identify and attack viral genomes. Just like there are different CRISPR systems, there are multiple anti-CRISPR proteins as well. One in particular mimics DNA to throw the CRISPR-guided detection machine off its course. 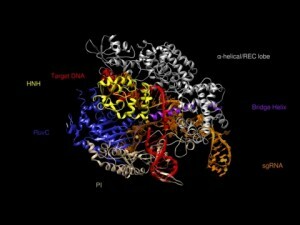 Scientists have been able to further discover certain aspects of CRISPR and anti-CRISPR systems by using a high-resolution imaging technique called cryo-electron microscopy. They have discovered that the CRISPR surveillance complex analyzes a virus’s genetic material to see where it should attack by having proteins within the complex wrap around the CRISPR RNA, exposing specific sections of bacterial RNA. These sections of RNA then scan viral DNA, looking for genetic sequences they recognize. Lander describes these proteins as being very clever because they “have evolved to target a crucial piece of the CRISPR machinery. If bacteria were to mutate this machinery to avoid viral attacks, the CRISPR system would cease to function.” Therefore, CRISPR systems cannot avoid anti-CRISPR proteins without completely chancing the mechanism used to recognize DNA. Another type anti-CRISPR protein works a bit differently. Based on its location and negative charge, this anti-CRISPR protein acts as a DNA mimic, fooling CRISPR into binding this immobilizing protein, rather than an invading viral DNA. Can Anti-CRISPR Proteins be beneficial? Researchers are saying that the understanding of how these anti-CRISPR proteins work are extremely important! According to an article on GEN, the discovery and understanding of anti-CRISPR proteins actually allows researchers to have greater control over gene-edits. 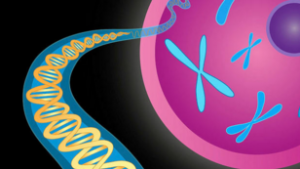 In this article, Dr. Sontheimer, a professor in the RNA The RNA Therapeutics Institute at UMass Medical School, expressed how “CRISPR/Cas 9 is a good thing because it introduces specific chromosome breaks that can be exploited to create genome edits, but because chromosome breakage can be hazardous, it is possible to have too much of a good thing, or to have it go on for too long.” Anti-CRISPR proteins can be beneficial and work as an off switch for CRISPR, therefore advancing gene editing! Crispr-Cas9 is a genome editing tool that is creating a whole lot of buzz in the science world. It is the newest faster, cheaper and more accurate way of editing DNA. Crispr- Cas9 also has a wide range of potential applications. It is a unique technology that enables geneticists and medical researchers to edit parts of the genome by cutting out, replacing or adding parts to the DNA sequence. The CRISPR-Cas9 system consists of two key molecules that introduce a mutation into the DNA. The first Molecule is an enzyme called Cas9. Cas9 acts as a pair of scissors that can cut the two strands of DNA at a specific location in the genome so that bits of DNA can be added or removed. The second is a piece of RNA called guide RNA or gRNA. This consists of a small piece of pre-designed RNA sequence located within a longer RNA scaffold. The scaffold part binds to DNA and the pre-designed sequence guides Cas9 to the right part of the genome. This makes sure that the Cas9 enzyme cuts at the right point in the genome. “Our data indicate that Cas9 breaks could be different at a molecular level from breaks generated by other targeted nucleases, such as TALENS and zinc-finger nucleases, which suggests that strategies like the ones we are using can give you more efficient repair of Cas9 breaks,” coauthor Christopher Richardson, a postdoc in Corn’s lab, said in a statement. Arguably the greatest thing to happen to genetics since the Human Genome Project, Crispr-Cas 9 has been getting a lot of attention. The Los Angeles Times wrote an article approximately 4 months ago discussing the ins and outs of the new gene editing breakthrough. The concept of editing genes is nothing new for scientists. They’ve been doing it since the 1970s. So many people are asking “What makes Crispr so special?” The answer is convenience. Crispr-Cas 9, although still filled with flaws, is the easiest gene editing tool to use out there right now. Scientists from UC Irvine and UC San Diego have used it on mosquitoes to fight malaria and scientists have begun to use it on human embryos as well. 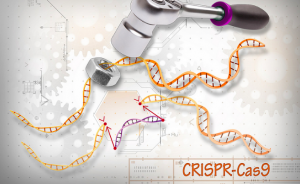 Crispr is an acronym for Clustered Regularly Interspaced Short Palindromic Repeats which is a relatively complicated way of saying “gene editing tool.” What Crispr does is it can target certain parts of a strand of DNA and “delete” them from the strand. In reality they aren’t being “deleted” but “turned off” so RNA doesn’t code it and begin to manufacture proteins for it. But the real question is why certain people are against gene editing. Everyone’s seen the movie GATTACA where gene editing is not only commonplace, but discriminatory. However in today’s world, the fear is much more strongly rooted than a fear of “geneticism” (genetic rascism). Using Crispr on viable human embryos to edit genes may have undesired effects. The turning off/on of one gene could result in the unintentional turning on/off of another. Also, many scientists believe that a parent making decisions for an unborn child can be unethical and unfair if the child did not want those changes to be made. And who knows, maybe in the future with the continuous use of Crispr and the development of more complex gene editing tools, “geneticism” could be a reality. 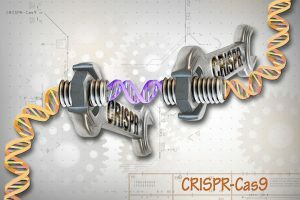 Other articles pertaining to Crispr are linked here and here for more information on the subject. The CRISPR-Cas9 genome editing system has transformed into an even better version of itself. 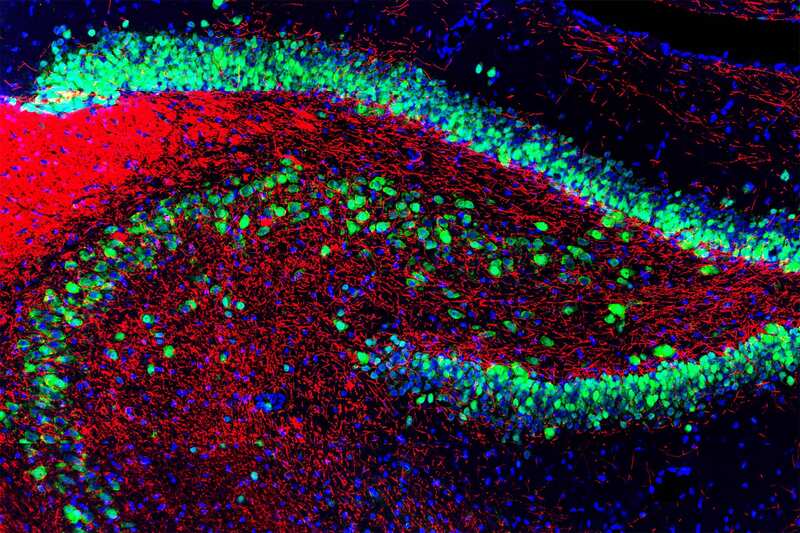 A new, elegant technique, coined by researches at the Broad Institute of MIT and Harvard and the McGovern Institute for Brain Research at MIT, has resolved one of the most reoccurring technical issues in genome editing. Primarily, the CRISPR-Cas9 system works to specifically modify a cell’s DNA. CRISPR is dependent on protein Cas9, as it is specialized for cutting DNA. The DNA, at a location identified by a RNA’s sequence matching the target site, is altered by Cas9. Though it very efficient at cutting its target sites, there is a large complication in the process. Once the Cas9 is inside the cell, it can also bind and cut additional sites that are not targeted. Because of this, undesired edits are produced which can alter gene expression or kill off a gene completely. These setbacks can lead to cancer or other problems. Feng Zhang, along with his colleagues at MIT, reported that by just changing 3 out of the approximately 1,400 amino acids composing the Cas9 enzyme from S. pyogenes, a considerable reduction of “off-target editing” to undetectable levels are observed. This newfound information was derived from studying the structure of the Cas9 protein. Since DNA is negatively charged, it binds to a positively charged groove in the Cas9 protein. The scientists predicted that by replacing some of the positively charged amino acids with a neutral charge, there would be a decrease in binding to “off target” sequences than to “on target” sequences. By mutating three amino acids, their technique proved to be successful. The team is calling this newly-engineered enzyme “enhanced S. pyogenes Cas9” or “eSpCas9.” It’ll be particularly useful for genome editing that requires precise specificity and it is said to be available for researches worldwide. I believe that this newfound resolution for the CRISPR-Cas9 genome editing hurtle is a huge game changer. This charge-changing approach might also be able to be used for other experiments involving RNA-guided DNA targeting enzymes. Ethical and societal concerns have also risen due to the idea of rapid and efficient genome editing. The eSpCas9 is highly beneficial in the scientific community, however there is a lot more research needed to be done in order to be used clinically. CRISPR: Is Science Going Too Far? CRISPR is a some-what new genetic tool in the field of science to edit human embryos. Using CRISPR, scientists can edit the genes of organisms more precisely than ever before. It uses RNA and an enzyme that slices up invading virusesF. One use of this new technology is to fix mutations that cause genetic diseases. Ethical concerns arose in April of 2015 when Chinese research used CRISPR to edit nonviable human embryos. In addition, some fear that the use of CRISPR to give the embryo traits not found in their genetic code can lead to a obsessive gene culture like the one found in Gattaca. This ethical debates caused scientists to meet at an international summit hosted by the United States National Academies of Sciences and Medicines, where the scientists discussed the ethical concerns of CRISPR but agreed to continue researching it cautiously. In addition, some argue that using CRISPR for gene editing defeats the sacredness of the human genome and is unnatural. To this point, Sarah Chan from the EuroStemCell argues, “There is nothing sacred or sacrosanct about the genome as such. The human genome – the genome of humanity as a whole, and the unique individual genome we each possess – is merely the product of our evolutionary history to date”. From this point of view, the genome is merely a record of one’s history, but to some religious groups it is a symbol of life which should not be tainted with. So readers, what do you think? Should we use this tool to help cure treatable diseases, or does this new technology cross the line between scientific mechanisms and morality? What type of genes should this new tool be allowed to edit?